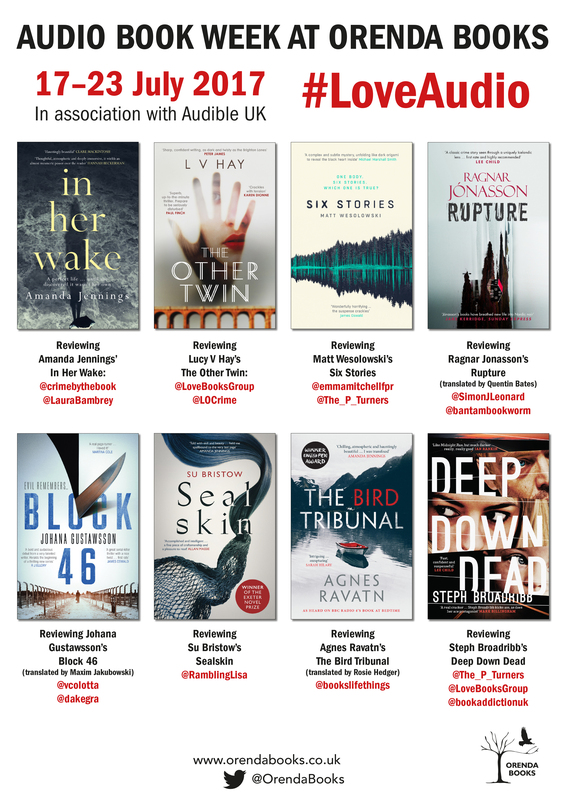 Delighted to be taking part in Orenda Books’ Audio Week, where a host of awesome bloggers (and me) are reviewing the audiobook versions of some fantastic Orenda titles. Plus I’ve got *two* copies of Johana Gustawsson’s Block 46 audiobook to give away! More on that later. Falkenberg, Sweden. The mutilated body of talented young jewellery designer, Linnea Blix, is found in a snow-swept marina. Hampstead Heath, London. The body of a young boy is discovered with similar wounds to Linnea’s. Buchenwald Concentration Camp, 1944. In the midst of the hell of the Holocaust, Erich Hebner will do anything to see himself as a human again. Are the two murders the work of a serial killer, and how are they connected to shocking events at Buchenwald? Emily Roy, a profiler on loan to Scotland Yard from the Canadian Royal Mounted Police, joins up with Linnea’s friend, French true-crime writer Alexis Castells, to investigate the puzzling case. They travel between Sweden and London, and then deep into the past, as a startling and terrifying connection comes to light. Firstly, the story. It’s dark and often horrific, told in part through flashbacks to the Buchenwald Concentration Camp towards the end of the Second World War. The characters here are twisted and barbaric in their treatment of the prisoners, and you’re dragged along through the story of Erich Hebner as he does what he needs to do to survive. How this then links to the murder of Linnea Blix in the present, or to the murders of a young boy in London, is what drives this story. The characters are brilliantly realised – I loved Emily Roy and Alexis Castells in particular as they unpick the unpleasant clues behind these horrific murders. There’s a real international feel to the book – written by a French author (and here translated into English by Maxim Jakubowski), with the action moving from Falkenberg in Sweden to London, with a Canadian Behavioural Insight Analyst (Roy) and a French crime writer based in London (Castells). Regular readers of this blog know of my love of books which give you a sense of place, and Block 46 delivers this in spades, across the various locations in the book. The audiobook is narrated by Patricia Rodriguez and Mark Meadows. If I had any criticism, I found Patricia’s delivery to be a little too measured and slow. However, the great thing about the Audible app is that you can alter the speed of the narration. I found that by bumping it up fractionally to 1.25x speed, the delivery felt better for me, and I got through the book quicker – always useful when you’ve got a lot of other books to read! The shift between Rodriguez and Meadows as narrators worked really well and really gave the story an extra dimension. Karen at Orenda Books has given me TWO copies of the audiobook to give away – leave a comment here on the blog, or retweet a link to this post – I’ll pop all the names into a random number generator next week and announce the winners on twitter. You’ll need an account at audible.co.uk though! You can find Johana Gustawsson on twitter @JoGustawsson. Block 46 is published by Orenda Books. There are so many good things about Block 46 around, I am loving it! I’ve seen lots of excitement about this one, I shall definitely add it to my wishlist.